Let's get right down to it: The key to successful SEO is concentrating on long-tail keywords. Although these keywords get less traffic than more generic terms, they're associated with more qualified traffic and users that are typically further down their path of intent. The good news is that choosing the right long-tail keywords for your website pages is actually a fairly simple process -- one that's made all the more simple and quick when you use the right tools to perform your keyword research. Download our free SEO template here to organize your keyword research into an actionable plan for your site. In this post, we'll cover the nine best tools out there for performing keyword research for your website content. Before we get started though, let's briefly go over two important things to consider as you do your research: relevance and (if applicable) location. Relevance is the most important factor to consider when choosing the right keywords for SEO. Why? Because the more specific you are, the better. For instance, if you own a company that installs swimming pools, it's likely that you'd attract more qualified prospects by targeting a keyword such as "fiberglass in-ground pool installation," rather than "swimming pools." That's because there's a good chance that someone searching for "fiberglass in-ground pool installation" is looking for information on installation or someone to perform the installation ... and that could be you! Sure, optimizing for "swimming pools" has its place. But there's no doubt that this keyword will attract a much more generic audience that may not be looking for what you have to offer. Go for the relevant, long-tail keywords instead. Another major factor to consider when optimizing for the right keywords is location-based searches. When looking for contractors and services in their specific area, search engine users will usually include their location in the search. So, "fiberglass in-ground pool installation" becomes "fiberglass in-ground pool installation in Boston, MA." If you operate in one geo-location, you may want to consider adding location-based keywords to all of your pages, since traffic from other locations isn't going to be very much help to you. If your business operates in several geo-locations, it is also a wise choice to create a separate web page dedicated to each location so you can make sure your brand is present when people are searching for individual locations. Now, how do you choose the right keywords for your business? We certainly don't recommend guessing, for obvious reasons. Instead, there are many ways to research and find long-tail keywords that are right for your business. Here are nine awesome free and paid keyword research tools you can use to quickly and easily identify strong long-tail keywords for your SEO campaign. When you input one keyword, multiple keywords, or even your website address into Keyword Planner, Google will spit out a list of related keywords along with simple metrics to gauge how fierce the competition is around each one and how many searches it gets on both a global and local search level. 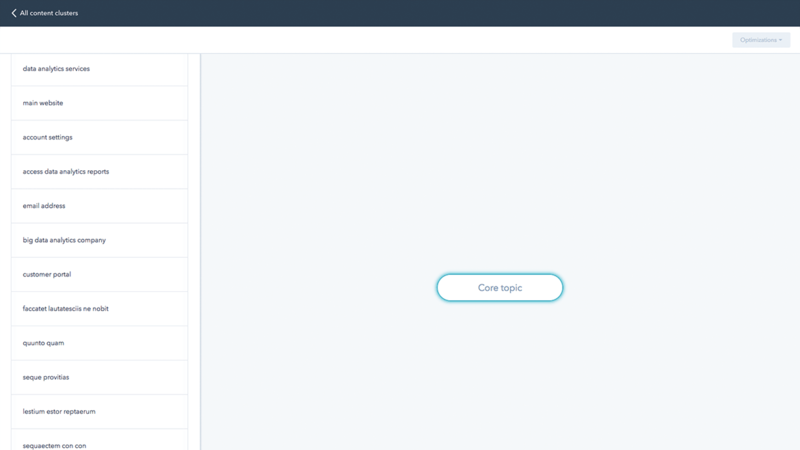 It'll also show you historical statistics and information on how a list of keywords might perform -- and it'll create a new keyword list by multiplying several lists of keywords together. Since it's a free AdWords tool, it can also help you choose competitive bids and budgets to use with your AdWords campaigns. Unfortunately, when Google transitioned from Keyword Tool to Keyword Planner, they stripped out a lot of the more interesting functionality -- but you can make up for it somewhat if you take the information you learn from Keyword Planner and use Google Trends to fill in some blanks. Google Trends is another free tool from Google. It lets you enter multiple keywords and filter by location, search history, and category. Once you enter that information in, it'll give you results that show how much web interest there is around a particular keyword, what caused the interest (e.g., press coverage), and where the traffic is coming from -- along with similar keywords. The best part about Google Trends is that it doesn't just give you static keyword volume numbers like most keyword research tools. Instead, it generates colorful, interactive graphs that you can play with, download, and even embed on your website. It'll also give you more dynamic insight into a keyword with information like relative popularity of a search term over time. Interestingly, its data doesn't include in repeated queries from a single user over a short period of time, which makes results cleaner. It also groups together searches that it infers to mean the same thing, like misspellings. One way to use Google Trends? If you're trying to decide between two keyword variations for your latest blog post title. 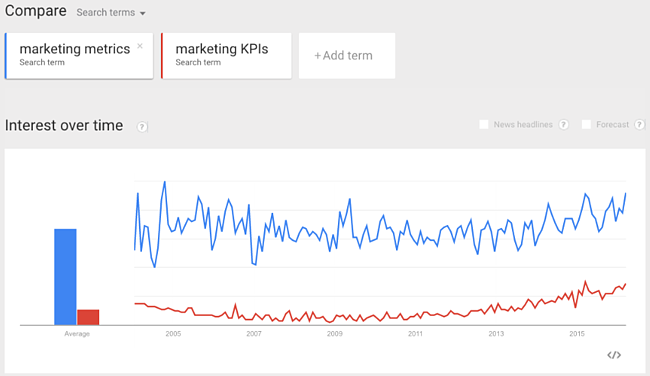 Simply perform a quick comparison search in Google Trends to see which one is getting searched more often. Keyword Tool is pretty rudimentary online keyword research tool, but if you're just looking for a list of long-tail keyword suggestions related to one you already have in mind, then it can be useful. It's also totally free -- to use the most basic version, you don't even need to create an account. What Keyword Tool does is use Google Autocomplete to generate a list of relevant long-tail keywords suggestions. The search terms suggested by Google Autocomplete are based on a few different factors, like how often users were searching for a particular term in the past. This type of suggestion tool can help you understand what people are searching for around your topics. For example, bloggers might use a tool like this to brainstorm blog post titles that'll do well in search. Again, all the free version does for you is generate other keyword suggestions in alphabetical order -- it doesn't tell you anything about search volume or cost-per-click (CPC). To get that information, you'll have to upgrade to Keyword Tool Pro. The Pro version will also let you export the keywords and use them for content creation, search engine optimization, CPC/PPC, or other marketing activities. Term Explorer offers probably the deepest research reports of any keyword research tool on the market. From one single seed term, you can get over 10,000 keyword variations. Best of all, the tool does a great job of keeping the results as relevant as possible and pulling through lots of supporting metrics with them. It'll give you data for all the results on page one of search engine results pages (SERPs), including the number of results, link strength, trust score, and keyword difficulty. To help you get a handle on your competitors, you can use the tool to research domain age, page ranking, and links, as well as the word count, page rank, links, outbound links, and the number of keyword occurrences in title, URL, and headers for individual webpages. You can also export all this data into a CSV for your own analysis. Note: If you only plan on using it a few times a day, there is actually a free version of this tool that'll do five tiny keyword jobs and five keyword analyses per day, with no queue priority. 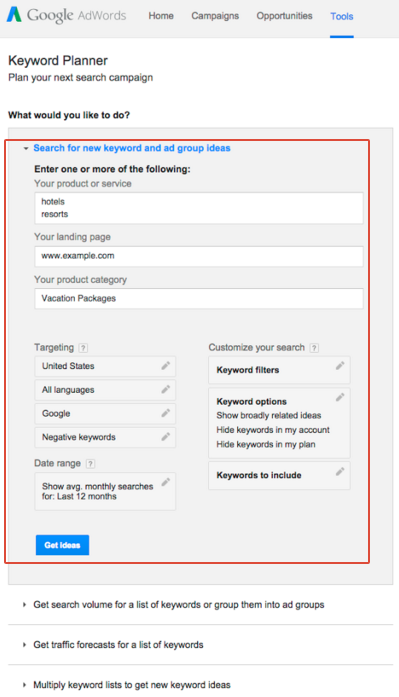 The keyword difficulty tool from Moz is one of the most useful components of their paid suite. It's a fantastic resource for analyzing the competitiveness of a keyword and for unearthing low-hanging fruit. 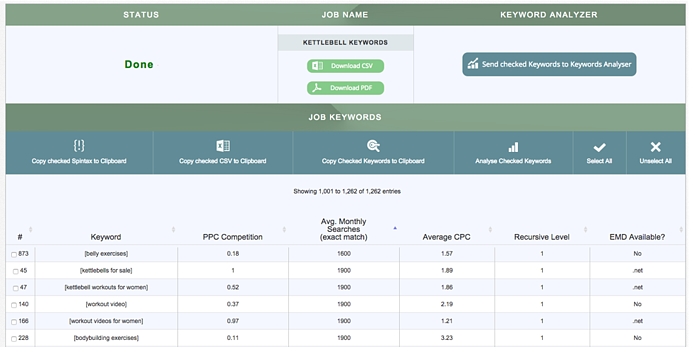 When you input a keyword into this tool, it'll find the top 10 rankings for that keyword. Then, it'll assign that keyword a "Difficulty Score" based on the pages that currently rank for that word. You can look at search volume data for your keywords, then pull up the SERP to see the top 10 results for each term. 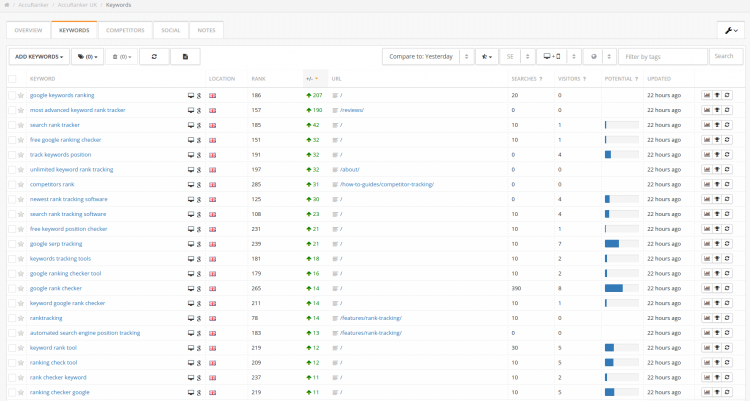 Want to do some competitive keyword analysis? You can use the tool to see who else is ranking for your targeted keywords, along with information like each site's page authority and the number of root domains linking to their page. You can also export all this data into a CSV for your own analysis. 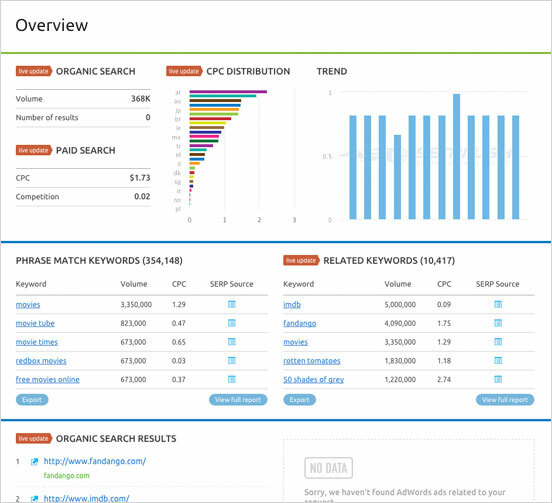 SEMrush is a competitive research tool that lets you keep an eye on on your competitors' keywords to find opportunities to bump them out for a top position in Google's and Bing's organic search results. You can compare a number of domains against one another to evaluate the competitive landscape, including their common keywords and positions in Google's organic, paid, and shopping search results. Position tracking is kind of like a sophisticated version of Google Trends, letting you see a keyword's position in SERPs and analyze the history of rises and drops. Their colorful, visual charts are also super helpful for more quickly understanding trends and analyzing results. Ahrefs Keywords Explorer is similar to SEMrush, but with some extra bonuses and a much more intuitive design. For example, it’s able to estimate how many searches become real page visits. Not all of them do so, since Google gives instant answers for some queries. With Clicks and Clicks Per Search metrics, you’ll figure out traffic-generating keywords and skip dead-end options. When it comes to the number of relevant keyword suggestions, Ahrefs goes the extra mile. It runs the biggest database – 5.1 billion keywords for over 200 countries – which means it can detect opportunities other tools could be missing. Ahrefs can also help you with competitive research. 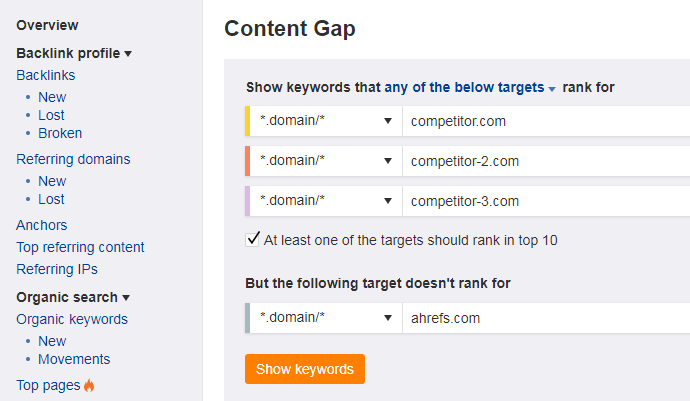 Their Site Explorer tool lifts the veil on competitors' keyword strategies, while Content Gap lets you compare competitor keywords with your own to identify your might-have-beens. Ahrefs will also email you about even the smallest ranking progress of your competitors. Backlinks have a direct impacton ranking, and backlink research is one of Ahrefs’ strongest muscles. Brian Dean, founder of Backlinko, say that Ahrefs is his #1 go-to tool for backlink analysis: "I've tested over 25 link analysis tools and none come close to Ahref's in terms of index size, freshness, and overall usability." Accuranker is a keyword rank tracking tool with a key differentiator: It's lightning fast while being extremely precise. So if you're used to spending hours monitoring the rank progression of your keywords, this'll end up saving you a ton of time. Other advantages of this tool? It has built-in proxies to get a quick glance at whose ranking within the SERPs for any given keyword. If you plan to report keyword metrics to your manager or your team, you'll like its scheduled weekly reports feature. It's also one of the best rank trackers out there that offers highly localized search engine rankings for your keywords. So if you're marketing your business to an international audience, it's a great tool for analyzing which pages are ranking in different countries. 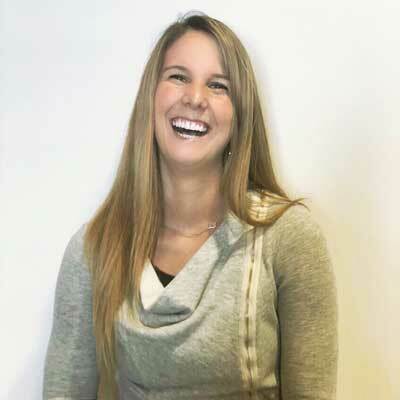 HubSpot also has its very own Content Strategy tool within the Marketing Hub. The Content Strategy tool helps you identify and research topics, find keywords or subtopics to go after, and ultimately help grow your content presence for generating more organic traffic over time. If you're a HubSpot customer, you can access the Content Strategy tool, click on Content > Strategy. Now that you know about all these great tools, get out there and start discovering your best keywords for SEO. What tools and methods do you use to find long-tail keywords? Share your favorites with us in the comments below.